NREN Members of UbuntuNet Alliance yet to introduce and implement an Identity Federation for their communities received a major boost in April 2016 when the Alliance presented them with an opportunity to start thinking towards the implementation of such services through the provision of a Federated Applications (FedApps) training workshop to system administrators from the UbuntuNet Alliance membership region. With assistance from the Middleware for Collaborative Applications and Global VIrtual communities (MAGIC) project, the Alliance pooled together 22 system administrators from its Member NRENs and took them through a 3-day hands-on FedApps training workshop held in Dar es Salaam, Tanzania whwre the Alliance its 10thAnnual General Meeting of Members on 29 April 2016. Apart from training the system adminitsrators on how to deploy Federated Identity management systems, the trainees were also introduced to the concepts of wireless roaming (eduroam) and the managemnet of certificates for Signing and Encryption of sensible data. 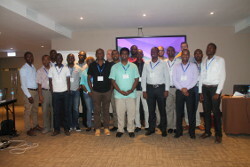 UbuntuNet Alliance Special Projects Coordinator Chris Rohrer teamed up with South Africa National Research and Education Network (SANReN) Senior Engineer Siju Mammen to deliver the course content to the trainees most of whom were drawn from NRENs that are yet to create federations. Speaking to NUANCE after the workshop, Mammen was convinced that the trainees had grasped the technical skills that were imparted to them. The FedApps training workshop is part of the capacity building programme that UbuntuNet Alliance offers to NREN members with assistance from various projects and organizations. Since 2012 UbuntuNet Alliance has partnered with the Network startup Resource Center (NSRC) and the International Network for the Availability of Scientific Publications (INASP) to offer Train the Trainers workshops to campus engineers who have gone on to implement similar trainings in their home NRENs, reaching out to over 1000 engineers in the process.